Composed by Arvo Part (1935-). Choral part(s). With Standard notation. Universal Edition #UE19350. Published by Universal Edition (PR.UE019350). 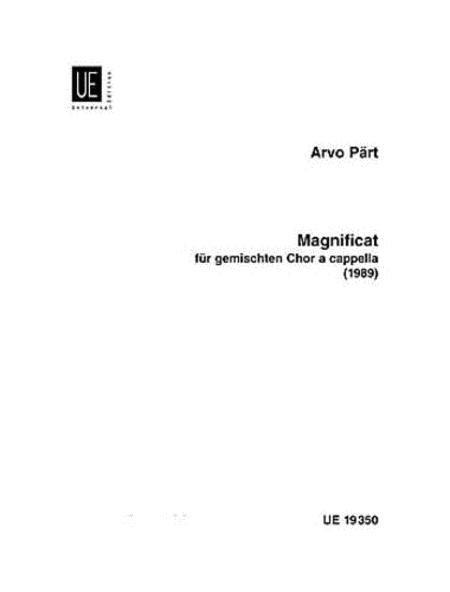 "The Magnificat is one of Part's most serene works, and has become deservedly popular with choirs around the world. The music perfectly expresses the exalted, tender joy of the Virgin Mother, and yet readily encompasses the text's other imagery without any sense of 'setting the words.' ln this way, the music has the feel of spontaneous lyricism, though this little masterpiece is anything but spontaneous in its construction, and displays the tintinnabuli technique at its most supple and refined." (Paul Hillier).